Hashtags are a favorite tool of conferences and event organizers, they enable Tweets about the conference or event to be organized and searchable. When an event has a hashtag, use it, follow it, and get in on the conversation. By establishing yourself as a thought leader, you will gain valuable followers who will spread your ideas and content in the future. Health Decisions, a clinical research organization (and one of our clients!) took hashtags one step further last week when they attended Biotech 2010, a conference to unite the Southeast life science comnunity. 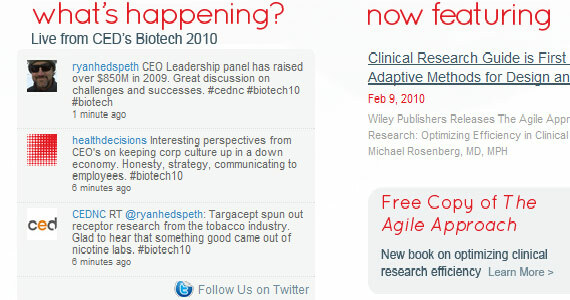 They changed their website for the event to include a Twitter feed of Tweets with the conference's designated hashtag (#biotech10). Health Decisions turned their website into a destination for people at the conference by converting their website into an aggregator of relevant conversation, while making it simple for visitors to begin following them on Twitter. The website update also let normal visitors and prospects of the site know that Health Decisions was at the conference and what was going on at the conference at that time. 1) It garnered over 225 views, meaning that even though we did not sponsor or present at the summit, we got the eyeballs equivalent to a keynote speaker. 2) It established us as not just attendees of the summit, but also knowledgeable and analytical listeners of those who did present. 3) Arguably most importantly, we still have an SERP rank of 3 for "Internet Summit in Raleigh", which is great for long tail and could be really helpful during the summit next year. Social media is at its best when it is social. Well before you even get to the event, read and comment on other attendees' blogs and websites, start following people who Tweet about the event, and begin conversations on the event's Facebook page. Think of it as pre-networking networking. By doing these things, in addition to showing knowledge and interest in the industry, you'll have something concrete and engaging to talk about when you meet these people in real life and get to put a face on that Twitter profile pic. What others ways could you integrate social media into event marketing? What's worked well and what didn't? Great ideas and examples. Along with hashtags, I have noticed a lot of people utilizing Twitter lists for events lately. Creating a list of attendees is a nice way to track track conversations before and after the event without having to follow (and potentially unfollow) a large number of people. I also find myself continuing to follow the lists well after the event because they are usually a good grouping of people interested in a particular topic. From a brand/exposure standpoint, it is also nice to be the creator of the list so that your username will show up in the list name/web address. Great thoughts Jonathan! Twitter lists are another great way to utilize social media for event marketing. This is another example of why the earlier you get social media involved in the event, the better. You're right on in recognizing the added value of being the creator of the Twitter list for that event. Thanks for your input!